Renowned hot spring towns can be found all over Japan. It is my absolute pleasure to introduce you to 3 of them. The beautiful winter wonderland – Ginzan, the easily accessible from Tokyo – Hakone and, one of the Big Three famous Japanese onsens – Kusatsu. 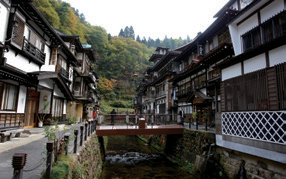 Located in the snow and watermelon abundant town of Obanazawa in Yamagata prefecture lies Ginzan Onsen. The onsen inns here are concentrated on either side Ginzan River, 10km east of the main Obanazawa township. As the sun sets, the gas lanterns of the retro-styled inns lining the river are lit up, creating a romantic atmosphere reminiscent of the early 1900s. 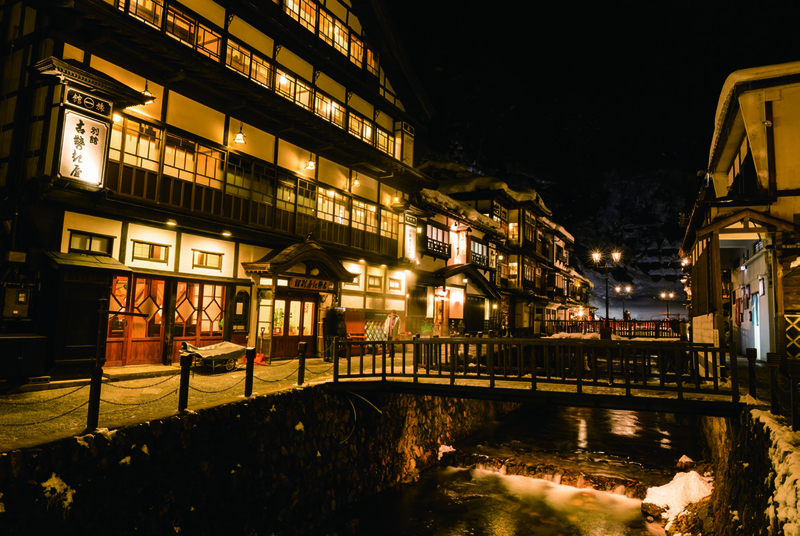 Although Ginzan Onsen is particularly famous for its beautiful night view, it has equally stunning sights for every season. Its brilliant greenery in early summer and colourful autumn leaves, for example, make it a popular tourist spot all year round. Following the discovery of silver in the 16th century, this town thrived in the early Edo period through its abundance, hence the name – Ginzan (Silver Mountain). Once the silver rush had subsided, it is said that the town turned its attention to customers seeking the hot springs for their health. Remnants of the silver mines can still be found today above the large waterfall deep within the onsen district. 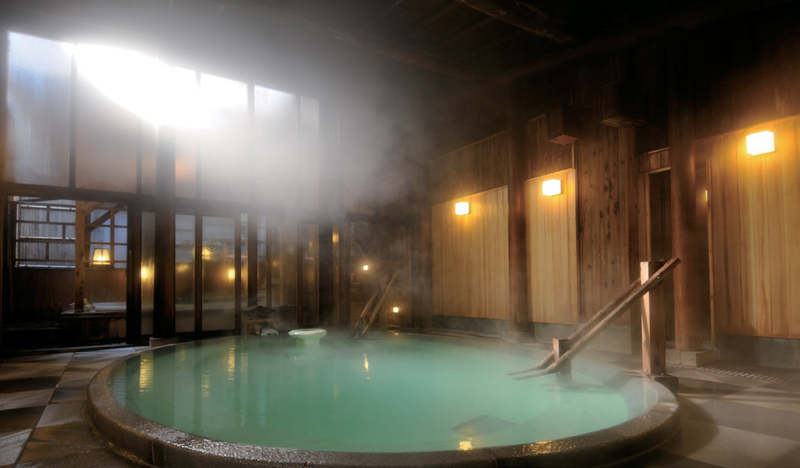 The milky thermal waters of Ginzan Onsen are said to be beneficial for nerve pain, rheumatism, skin conditions, injuries and female illnesses. Dip your feet into the hot springs as you listen to the gentle sounds of the flowing river with a delicious meal and enjoy your stay. Hakone Onsen is located right next to Tokyo in Kanagawa Prefecture and is easily accessible via car, train and bus – making it a popular onsen spot. 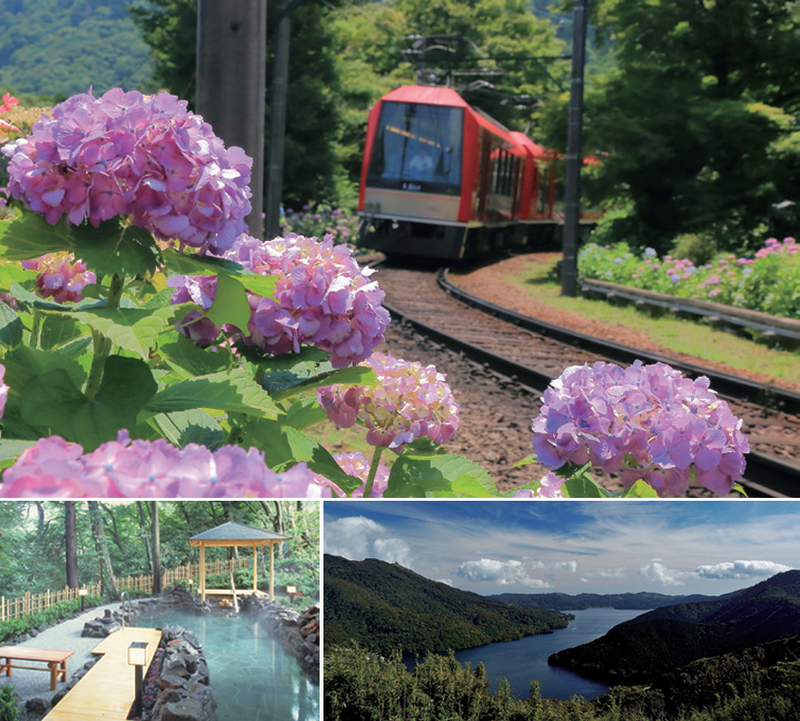 The fastest way to get there is via the ‘Romance Car’, a train which leaves from Shinjuku station and can take a mere 85 minutes to arrive at Hakone Onsen. Surrounded by mountains and nature, Hakone has far too many sights to see in one day – from hot springs to art and gourmet food. Of course, the hot springs are the town’s main drawcard. There are over twenty onsen districts in the areas around Mount Hakone. At the entrance of Hakone is the Hakone-Yumoto area which boasts over forty onsen inns and stores. It is the largest and oldest onsen area in Hakone Onsen. The thermal waters are simple alkaline based and are said to benefit those with nerve and joint pain, as well as improve blood circulation. The onsen district lies alongside two rivers – Hayakawa and Sukumogawa. Various different styles of ryokan sit on the riverside, such as old, nationally treasured inns, traditional Japanese inns and even large scale spa resorts. With over twenty establishments that offer day trip options, one can see why it’s popular spot for a casual dip in an onsen. KUSATSU IS A RENOWNED HOT SPRING WHICH HAS SOOTHED THE BODIES AND SOULS OF COUNTLESS JAPANESE FOLK THROUGHOUT HISTORY. If you’re departing from Tokyo, Kusatsu Onsen is another highly recommended spot. One of the Big Three Onsens (Kusatsu Onsen in Gunma, Gero Onsen in Gifu and Arima Onsen in Hyogo), Kusatsu is a renowned hot spring which has soothed the bodies and souls of countless Japanese folk throughout history. 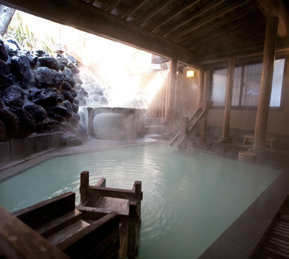 It has the highest natural thermal water yield of any hot spring in Japan, boasting over 32,300 litres a day. Kusatsu Onsen is also one of the few acidic hot springs in Japan with a pH of 2.2. Its unique sulfuric, highly acidic waters can dissolve an aluminium 1 yen coin within a week of submersion. Thanks to its antibacterial qualities, the thermal waters are said to benefit those with chronic skin and digestive ailments. The hot spring field in the heart of the onsen district is what keeps Kusatsu Onsen alive. 4000 litres of thermal waters flow out every minute and the area is constantly draped in rising steam. Inns and souvenir shops surround the area in order to draw from the hot spring field. Kusatsu Onsen is the biggest resort town in Japan with over 130 inns and hotels and over 120 souvenir shops. Nearby lies Mount Kusatsu-Shirane with its crater lakes, Kusatsu Kokusai Ski Resort, as well as Mount Asama and Karuizawa to the south, so a combined trip to the surrounding areas would make for a fulfilling trip. Gunma, the heart of Japan. Situated amongst towering mountains in the nature abundant, onsen (hot spring) filled town of Kusatsu, dwells a history rich, long-standing ryokan – NARAYA. Take a dip in an onsen and soothe your soul as you soak up the ultimate experience. If you are looking to experience a long established ryokan steeped in tradition, then look no further than NARAYA. It has the privilege of being located right next to a hot spring field in the centre of Kusatsu. Established in 1877, NARAYA has created the perfect balance of old charm with a clean and modern touch. NARAYA’s main attraction is, of course, the onsens. Of the six main veins of natural springs in Kusatsu, the oldest one is said to be the Shirohata (White Flag) spring which bubbles up next to the hot spring field. NARAYA draws from this slightly cloudy, high temperature spring. Before the thermal waters are piped to each individual bath, it goes through a process known as yumomi – the act of cooling the waters with 1.5 metre-long paddles by heaving it through the air. This inn is one of a select few which still continues this traditional practice today. Along with public baths segregated by gender, NARAYA also has private baths, made with Japanese cedar, available for reservation if you wish to be alone with your thoughts. The superb thermal waters combined with the refreshing scent of cedar gently caress the soul for a truly blissful experience. Also included with the private bath is a tatami mat room for you to relax in after a good soak. After a relaxing dip in the onsen, you can look forward to a traditional Japanese dinner made with the finest seasonal ingredients. Eating a delicious meal in a yukata is sure to blow all the stresses of travelling away.